winter farm, originally uploaded by jahansell. Popped by Pine Hill Farm, Kathy Blackshaw's place, to get some eggs today. The egg size is smaller, and she has to charge a bit more, than in summer, but they still beat supermarket eggs by a mile! By the way, her silo does NOT curve alarmingly to the right as it appears to in this photo - I never noticed before how much my camera distorts even at only moderately wide angles! Oh, and farm fresh eggs, even at a slight premium, sound wonderful!! This is very nice photo. 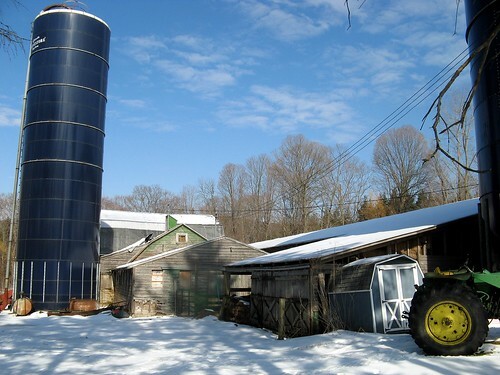 I love the blue silo against clear sky and snow.